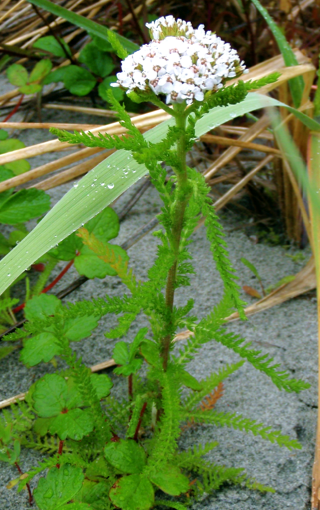 Yarrow grows in a variety of open coastal BC habitats including along shorelines. 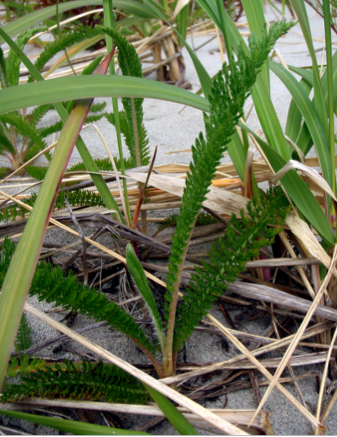 Yarrow's leaves are fairly distinctive, allowing for easy identification even when the plant is not in bloom. Photos by Sienna Hamilton (above) and Teegan Bennington (below). Yarrow is a 10-100 cm tall perennial plant. 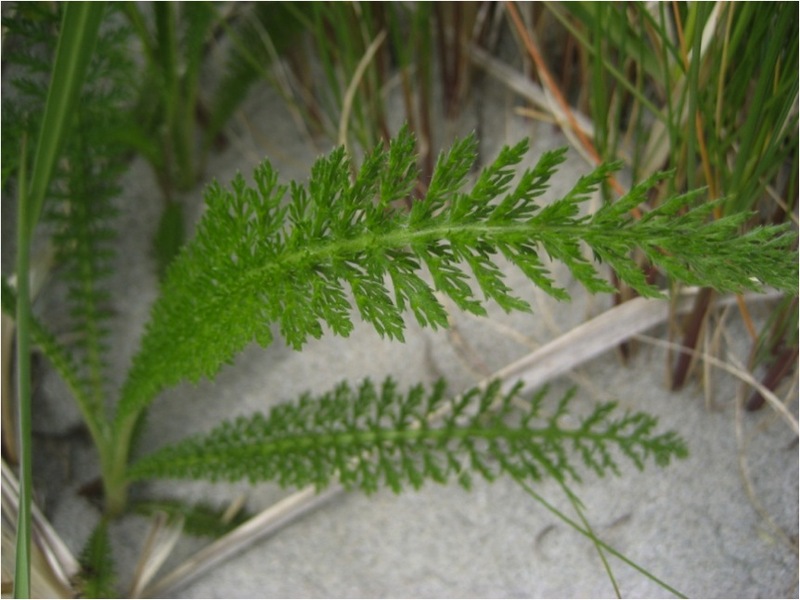 Its leaves have a distinctive fern-like look. Leaves lower on the stem are stalked, and those higher up are unstalked. The leaves are pinnately separated into compound leaflets (click here for a close-up of the leaves). Yarrow is an aster, which can have two types of flowers: ray flowers and head flowers. In this photo the ray flowers are the outer petal-like parts, and the head flowers form the inner clusters. The flowers are usually white, sometimes tinged with red or pink, and appear in flat- or round-topped clusters at the end of the stem. The taxonomy of this species is complicated, but for the purposes of this website we will refer to yarrow as a single undivided species. Four varieties of yarrow are recognized by some sources, and descriptions of these varieties can be found on the E-Flora species page. Yarrow is a common species throughout BC. It grows in open, dry or moist areas with good drainage, including rocky bluffs, meadows, roadsides, and shorelines. It is found from low to high elevations throughout most of North America. The only species with which yarrow could be confused is another Achillea species found in northeastern BC: A. sibirica or Siberian yarrow. Yarrow had many uses in traditional First Nations medicine. For example, the Nuxalk used it to treat bronchitis, the Squamish used it for measles, and the Squaxin used it for stomach ailments. Other conditions and ailments treated with yarrow include headaches, sore throats, sores, eyewash, diarrhea, and childbirth. Achillea millefolium L. In Klinkenberg, Brian. (Ed.). E-Flora BC: Electronic Atlas of the Plants of British Columbia. Lab for Advanced Spatial Analysis, Department of Geography, University of British Columbia, Vancouver. Accessed 09/09/2013. Pojar, J. and MacKinnon, A. (1994). Plants of Coastal British Columbia. Vancouver, BC: Lone Pine Publishing. P. 279.